Presented in a stylish compact size, the Pronto M51 power wheelchair with SureStep has true center-wheel drive performance for exceptional maneuverability and intuitive driving. The M51-R comes standard with a four-post seat mount and Invacare's adjustable ASBA rehab seating system. With its innovative SureStep technology, the Pronto M51 provides a smooth, less jarring ride over transitions and thresholds up to two inches in height while maintaining stability. 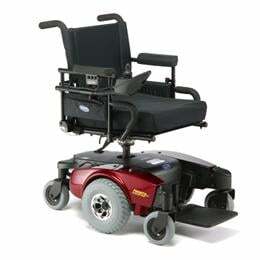 The Pronto M51 is attractively designed for optimum maneuverability and accessibility. New four-post seat mount with adjustable ASBA rehab seat can be expanded in both width and depth. Four-post seat mount also allows for adjustable seat slope and can be retrofitted with a power tilt system.